This is a heavy workbench that I initially custom made for a customer and which bears his name. This workbench is possibly the ultimate base for ones perfect workbench. Easy to adapt and dismantle. After getting regular demand for the same model I started offering it as a standard model. 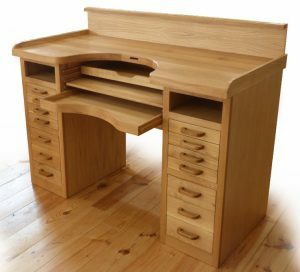 The model depicted below is the standard issue in oak, but it can also be made in beech for the same cost. Two drawer cabinets with 7 drawers each, can also be replaced by doors. 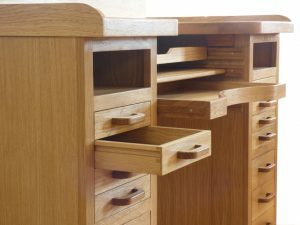 drawers assembled with dovetail joints. 2 large drawers under the top, one for tools and a curved one for filings. Pull out drawing table in the middle. 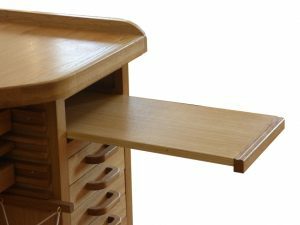 Open shelf above the drawers to lay tools or equipment. Worktop entirely in solid wood 44mm thick. half circle cut out 30cm deep. Rear edge with rail to store tools. Partly solid wood, partly veneered, finished with oil and wax. 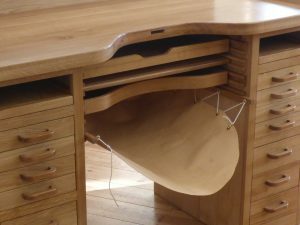 Below the curved middle drawer, drawing table and tool drawer. 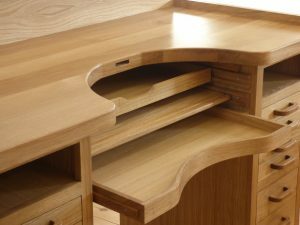 Drawer in solid wood (aside for the bottom panel) and dovetailed assembly. Below a workbench with several options, leather skin, pull out trays and a special cut out shape in the work top. A leather skin can be added for €70 VAT included. 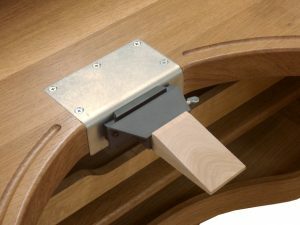 Below the benchmate system instead of the classical bench pin, also a routed groove along the edge of the work top.